Our jewelry has been sold at Yosemite National Park for over 20 years, and we are very proud of this relationship. The stores there carry a wide range of our mainline jewelry, and Mike has also designed many custom styles for the Park. One of which is this beautiful pair of "BridalVeil Falls" earrings. 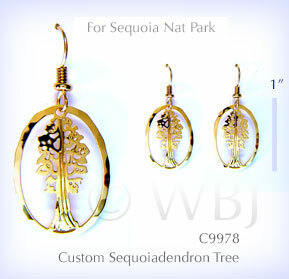 We are also honored to have worked with Sequoia National Park on this lovely pair of custom earrings and other projects. 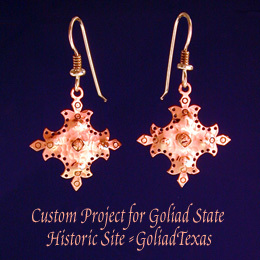 The Goliad State Historic Site is a more recent customer and we were delighted to have the opportunity to work on a custom range of earrings for them in a striking two-tone finish. 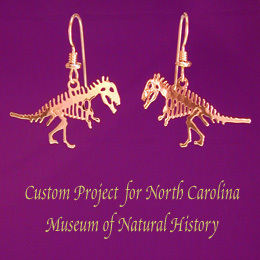 We especially enjoyed working with The North Carolina Museum of Natural Sciences on these custom dinosaur earrings for a large exhibit a few years ago. 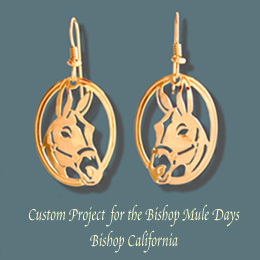 The Bishop Mule Days Festival here in California is a wonderful event and we are proud to have worked with them on these custom earrings. In addition to custom jewelry, Mike also makes intricate 3-dimensional custom ornaments. Typically, these are scale models of historic buildings and landmark properties. 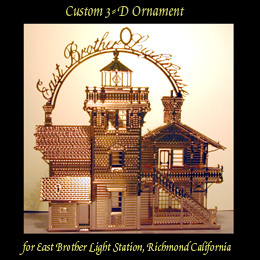 Among many others, he has done an extensive series of custom ornaments for the Richmond (California) Chamber of Commerce, including the East Brother Lighthouse Station ornament pictured here. 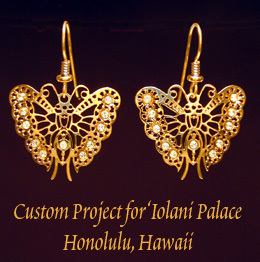 The gift store at the historic 'Iolani Palace Museum in Honolulu is a long-time customer of ours. The beautiful rhinestone butterfly earrings pictured here are part of our latest custom line of jewelry for them. The line reproduces select pieces of jewelry from the Museum's curated collection, formerly belonging to the Hawaiian monarchy.